A world circumnavigation at the equator would be 21,600nm but as we have covered over 24,000nm since we left in 1999 and are still only half way around, we could be accused of dawdling. Judging by the wonderful cruising we had this season in Fiji, it could be a few more years yet before we get back onto track again! We left Opua in New Zealand for the 1200nm sail north to the tropics at the end of May. That voyage is considered one of the world's worst five sailing passages and the boats that left in the weather slot before us took a real beating. So it was with great relief that we made it in under eight days, in robust but easily handleable conditions. (the trip back south again in October was much more troublesome). Our landfall was at Savusavu toward the eastern end of Vanua Levu, the smaller of the two main Fiji islands. Though this meant a day longer at sea, we were then upwind of most of the area we intended cruising so had the potential to travel without having to beat into strong trade winds. Savusavu is a charming little town where one quickly learns how warm and helpful the people of Fiji are. Almost everyone in the street acknowledges you with a cheery greeting of "Bula", showing genuine interest in where you hail from. There are two yacht clubs and whilst we were there The President's Cup yacht racing series was held, so the social life was nothing short of frenetic. 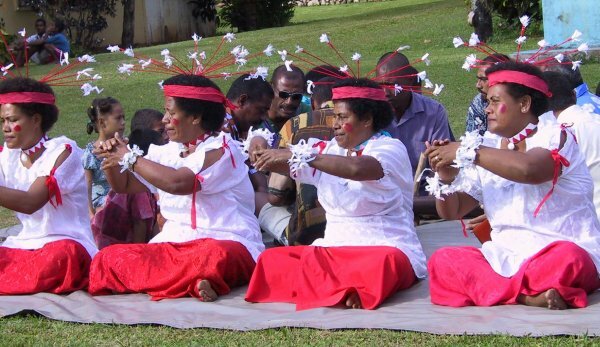 As part of this event they laid on a demonstration of the traditional sevusevu welcoming ceremony. By this time you will have realised that in common with most Polynesian based languages, Fijian puts a heavy stress on repeated syllables! 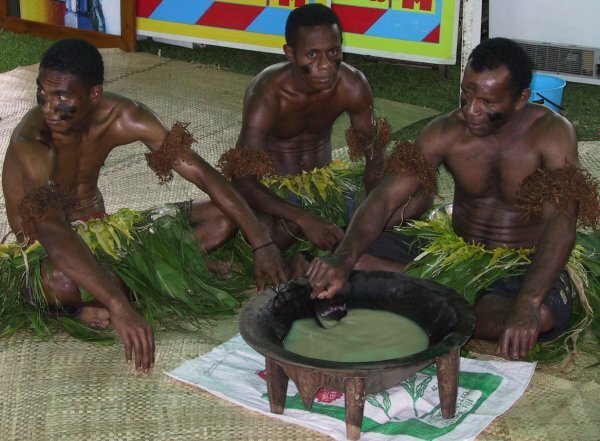 This sevusevu ceremony, where a guest provides a gift of yaqona root which is ground into kava, is still mandatory in most outlying areas of the country. It signifies the acceptance of a visitor by the tribe, who then extend hospitality and protection in a way far beyond the understanding in our culture. We found rural life was epitomised by strong family and communal links with much sharing of resources which even extended to taking in others children where parents may have found the going difficult. Whilst there, we were lucky enough to meet an owner of a plantation on the remote eastern Lau Islands, an area where visiting is discouraged in order to retain the still strong Fijian culture. Tony gave us a personal letter of introduction which enabled us to get to what turned out to be one of the most magical places we have ever seen. 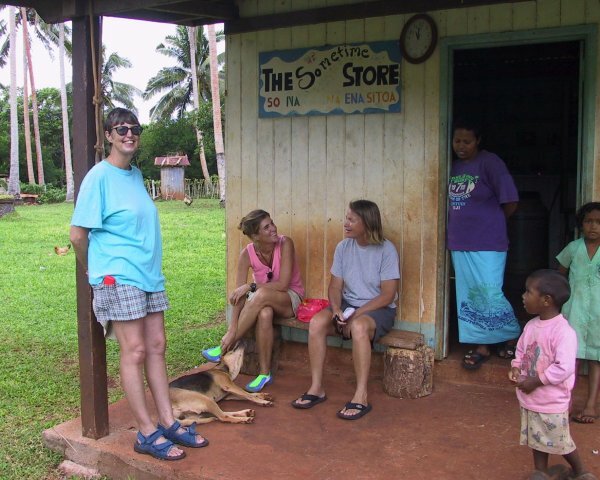 However, before we get to that bit of our story, more of our time in Savusavu. Throughout the South Pacific, from the Marquesas to New Zealand we have been delighted by the warm, vigorous and distinctively melodious performances of Polynesian church choirs. 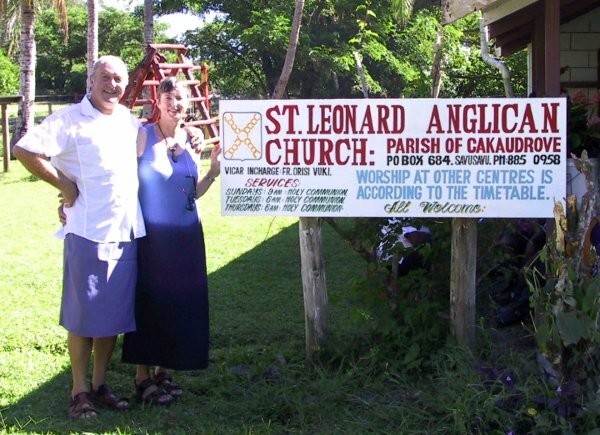 So, it was with great pleasure that we attended the service at St Leonards, Savusavu as this is the name of Di's church at home where her Mum still worships and where we were married, 38 years ago. In recognition of the event, Dave even wore his best dress! Seriously though, the Fijian sulu is a very practical garment in the tropics but he has found keeping to the kilt tradition a little too revealing as much too much time is spent sitting cross legged! The map below shows our route through the complex group of islands and reefs that make up the Fijian archipelago. Almost all the land masses are fringed by coral reefs which sometimes have narrow passes one can cautiously gain access through. We say cautiously as there are few navigational marks outside the three main ports of Suva, Lautoka and Savusava, eventhose there are being generally small and frequently damaged or missing. To add to the problems, the waters off larger islands are often made less than clear by run-off and virtually all the charts are in error by as much as 0.6nm. So, certainly not a cruising ground for the feint of heart but a richly rewarding experience for those that venture forth and survive. The passage out to the Exploring Isles of the Lau Group is only around 120nm but is directly into strong prevailing, E/SE trade winds. Amoenitas's performance beating into 20-30kt winds is exceptional but the killer in South Pacific conditions is the seas which build to waves of over 3m, making windward passages a punishing experience, for both boat and crew. Normally, to get there one would have to beat up the coast in short hops, holing up in several rolly anchorages in bays and on atolls. We were however blessed by the most fleeting of respites that enabled us to sail directly there in light breezes from north of east. It was probably not a coincidence that we arrived there on Di's birthday, thanks to her very special present from the elements. The Exploring Isles comprise six small islands within a heart shaped coral reef around 40km across. We were based on the largest, Vanua Balavu being further restricted by local rules to about the northern third of the island only. There were several anchorages, two of which have been described as probably the most beautiful in the whole South Pacific. We would probably concur. 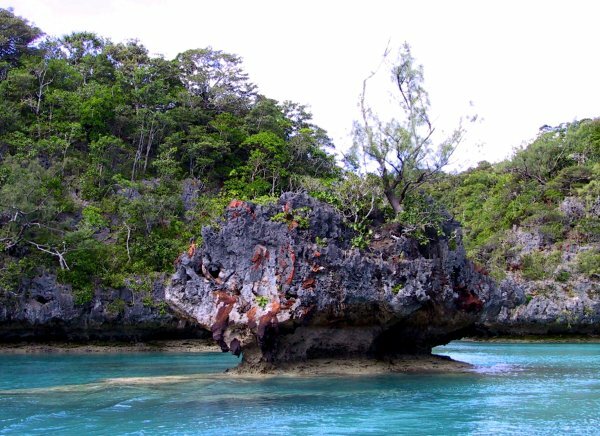 Below is our favourite one where the rough terrain of limestone and coral rock fell sheer into the azure sea. The complex pattern of bays islets and rocks, all undercut by erosion made for fascinating exploring (is that how the name was derived?). Getting ashore was a challenge though, sometimes solved by employing our 3m section of aluminium ladder that we use to reach the solar panels for cleaning and wind generator maintenance. Thank goodness there was nobody around to witness us rowing ashore in the tender with both our heads through the rungs, resting the ladder on our shoulders! We spent close to three idyllic months in the area and would have stayed forever but for the practical issues of cyclones and the almost total lack of supplies. There was the odd village with a small shop but only one distant town had other than the most basic of supplies (flour, rice, cooking oil and paraffin lamp mantles). Thrown on our own resources we quickly adapted to self sufficiency. Di became expert at preparation of the local root crops of cassava and taro whilst Dave reverted to hunter gatherer role with spear gun, fishing rod and coconut de-husker. We could feed ourselves well on the local fish delicacy, coral trout, supplemented by the odd lobster, squid or giant land crab. Below is a good illustration of the geology of the area with vegetation of many varieties clinging doggedly to bare rock in what is a very dry environment. 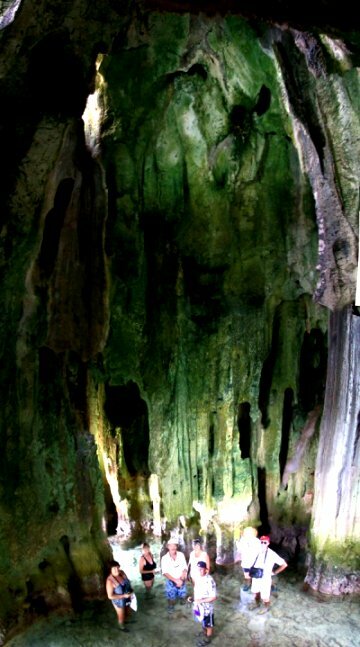 In some of the caves we explored we could see roots had penetrated many metres through fissures in the rock in an attempt to survive in what is a very moisture scarce winter dry season. The remote cave below is known by the locals as Vale Ni Bose (The Meeting Hall of the Gods) having a traditional religious significance. Pictured here at low water, we were standing around knee deep in a staggeringly impressive chamber around 15m in diameter and 40m high, complete with two entrances and festooned with stalactites. To get the picture Dave had to climb nearly half way up the wet and slimy cave wall, taking five vertically overlapping images that could be 'stitched' by the computer. Its amazing what is possible nowadays with readily available image processing software. We'll never take any image we see at face value any more. We spent many hours exploring inland in what was the most incredible difficult of wooded terrain. From a distance the forest canopy gave an impression of a smoothly undulating landscape. Nothing could be further from the truth, as razor sharp rocks were formed into towering spires and narrow canyons. Many were dead ends which often lead to a difficult technical climb into the adjoining system. Sometimes a foray of 500m was all that could be managed in the course of a morning. There were however some compensations in beating a trail where few if any people had ever ventured. 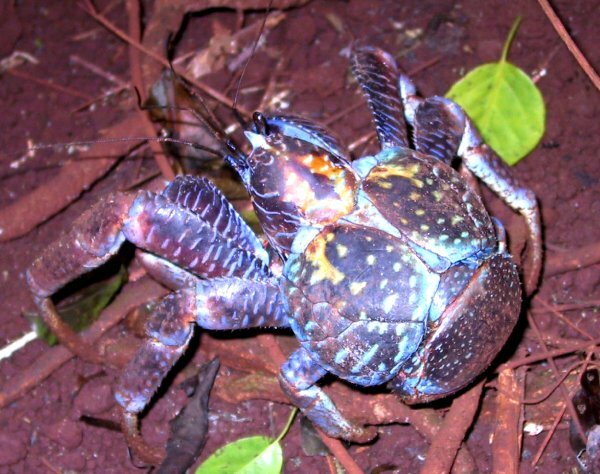 There were many land or coconut crabs to be found. This one was 50cm across but they are known to reach over a metre on some very remote, uninhabited atolls. They make excellent eating with a sweet rather than the salty flavour of their marine cousins. Dave made the mistake of carrying the first one we caught in his rucksack, only to discover the scratching sensation on his back was the huge claw clutching at his shirt. Taking off the shirt/rucksack combo didn't help as the creature clung on so tenaciously the sack hung from the shirt which had to be ripped to release it. The plantation that had issued us with the invitation covered around 600 acres, producing copra from coconut palms and fattening beef. There was a small and welcoming village of workers and their families which had as it's focus this small store with such basic supplies that all we ever found of use there was a bottle of cooking oil. Being so isolated, the people loved to mix with the few cruisers so there were many invitations to shared meals in their homes and afloat. Not only were we welcomed to their village but we found ourselves included in all the parties and festivities as well. Here's Di sitting with Niko on the occasion of his 16th birthday which marks his emergence into the world of manhood. 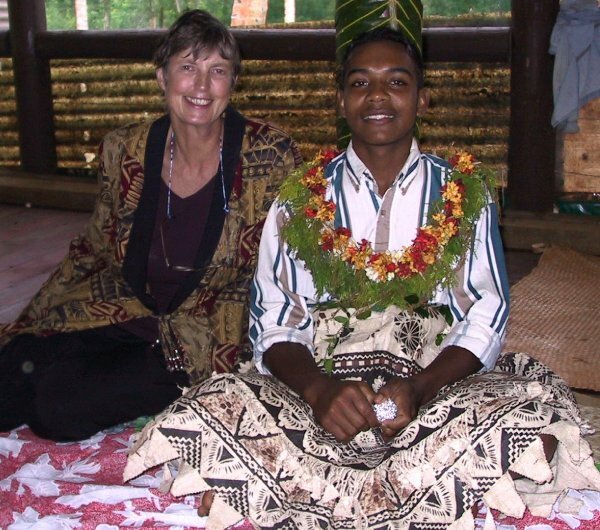 In addition to the traditional lei of flowers he has a tapa skirt made of beaten mulberry tree bark on which a brown and black pattern is painted. This was a long session of feasting, dancing and kava consuming, attended by the whole village, children and all. The family below lived slightly away from the main habitation toward a harbour where we often anchored, so we saw quite a lot of them. As was so often the case we were confused by the names we heard them called. He told us his name was Ram but by the community he was known as Santori. Most of them seemed to have a formal Fijian name but were referred to by one or more nicknames as well. They tended to tell us the one they thought we could pronounce the easiest. Christopher, their baby was a favourite of Di's who spent many an hour broodily holding him as a run up to our entering the realms of grandparenthood. Other special friends were Emma and husband Noko whose son had the 16th birthday whilst we were there. 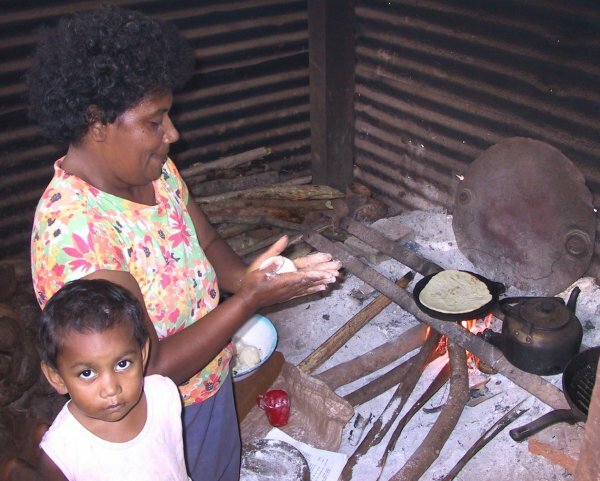 Here she is baking chapatis in their outside cooking shed. It was amazing what cakes could be produced over a wood fire using a metal lid of an oil drum as a hotplate. Note how economical on wood the fire is. We Palangies (Europeans) would need a whole pile of it for our BBQs. To perform our formal sevusevu ceremony before the local chief we travelled to the larger nearby village of Daliconi. Though it was only 6km as the crow flies, there is no practical land route through such harsh terrain. We got there in the local village open boat via a circuitous route within the outer reef. Later we took Amoenitas there to spend a couple of weeks with that community. We got on extremely well with them socially and Dave was able to solve many of their electronic, electrical and engineering problems. This made us much in demand to attend their church services. 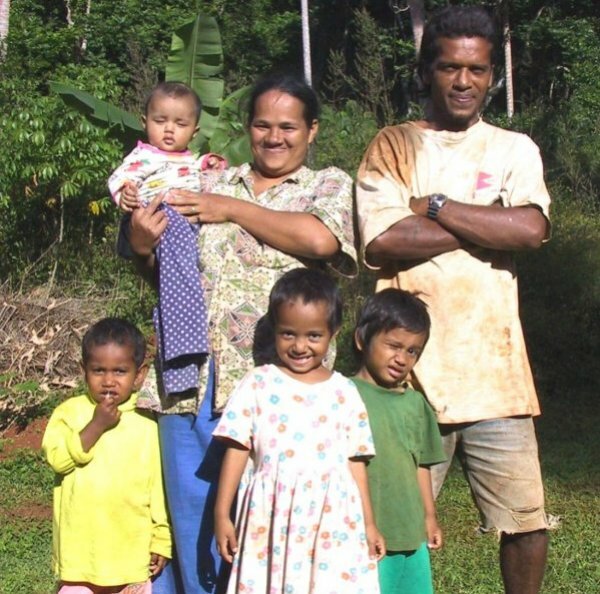 Most Polynesian peoples are very religious, in the wake of a plethora of European missionaries, resulting in this village of 200 souls supporting no fewer than five churches. Our Sunday problem was how to put in as many appearances as possible, so minimising any offence that might be taken where we couldn't respond to every invitation. Below is Di seated on the sitting room floor of Joeli's house for the communal meal that follows every Sunday service. We became part of the scene there for a while, being greeted warmly by old and young alike. Embarrassingly they christened us 'King Dave and Lady Di', not an epithet we were entirely at ease with. The local junior school was located in Daliconi so children from the surrounding area travelled daily or more commonly spent the weekdays away staying with family or friends in the village. The senior schools were at the bigger villages of Mavana or Lomaloma where almost all the students lived away from home. Paulini, the local headmistress persuaded Dave to give a talk to a gathering of all the school about computers, a difficult topic as non had ever seen one and most of them had never even heard of such things. 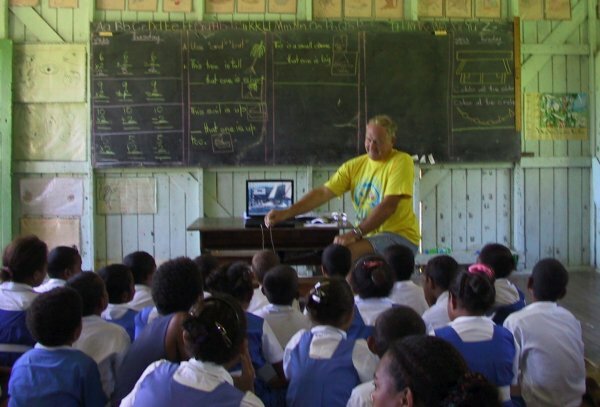 There was only one working computer within the island's educational system at the Lomaloma senior school. As there was no one who understood how to use it and as it could only be powered after 6pm for three hours when the electrical supply was on, it was effectively out of reach for all the students. What Dave ended up doing was illustrating many of the things a computer could be used for, from navigation to home entertainment. Here he is, microphone in hand, recording the singing of the school song. Without doubt the tasks they warmed too most were the display of digital photographs, many of them featuring themselves or families and the showing of movies from VCDs. The space craft race sequence from Star Wars, Attack of the Clones brought them all to their feet. We were also around for the annual Solo, a very competitive Methodist Church fund raising event where all five clans gathered to try to outdo each other's contributions. Once the serious matters of coin were behind them, the clans sat down each in their own, highly decorated, tented areas for a magnificent feast. Because there is only limited electrical power for the three hours after dusk, refrigeration is unknown there. This means that the only way to eat meat is to prepare and consume it communally within a day. That day was a major blow out with beef, pork, goat, chicken, fish and for the real gourmand, bat. These are serious bats with wing spans of close to a metre (taste just like chicken). Once the serious feasting was over, the entertainment began. This took the form of a traditional Meke where groups sing and dance with special costumed performances by the women and men alone. The men's displays are simulated warfare whilst the ladies below are performing one of the well known sitting dances. In the January of this year, cyclone Amie came directly over the archipelago inflicting serious damage to these poor and isolated communities. Houses were destroyed and the resulting, almost complete defoliation of trees and crops left the populace with little to eat. When Amoenitas arrived in late June the process of recovery was well underway but one major problem remained. 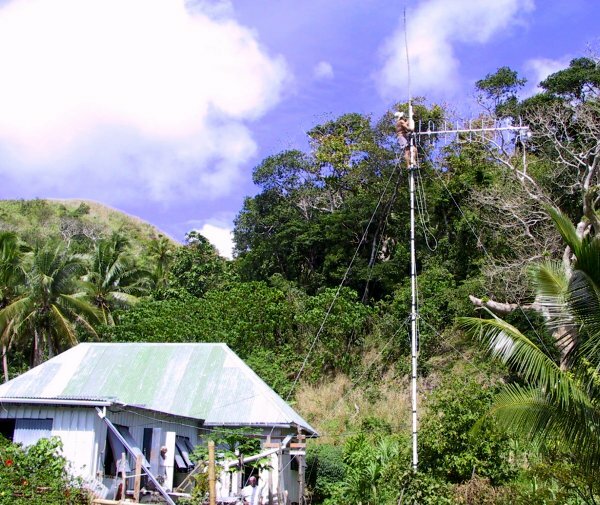 Contact with the outside world had been maintained with a VHF radio telephone system linking the remote islands through a series of repeaters. Amie had taken out this link. So, armed with a couple of multimeters and a directional RF power meter, Dave set about re-kindling the old skills. After a couple of days work the link was restored and a queue formed of people wanting to catch up on a backlog of five months interchange of news with distant family and friends. To observe the look of delight on their faces was worth any effort, even though it was hard to understand where such a poor community found the funds to pay the phone charges. The sting in the tail was that news of the arrival of a tame engineer spreads fast and within days a growing pile of TVs, video and DVD players was flooding Dave's way. What sort of poor community is this we thought? Eventually the stock of components carried on the boat was exhausted when the school's headmistress started to lend out her faulty portable generator which was blowing up equipment by producing an output of 360v AC into small loads like home entertainment. The scene below is Dave 15m up an antenna mast, installing a marine band VHF antenna he constructed within a fishing rod and mounted on a 7m long pole to clear surrounding obstacles to propagation. It was certainly good to be able to help the community when they had no other source of technical support but it did get rather out of hand. When virtually every broken item that had expired over the last few years started to appear, we said fond farewells, promised to return next year if at all possible and fled back to the isolation of the Bay of Islands. Eventually, after nearly three months we reluctantly left the Lau Islands, heading north to explore the area around the large island of Taveuni. We soon found a small Indian store to restock our very depleted larder so we could continue to enjoy the many sheltered anchorages in the area, many with good snorkeling and diving in pristine waters. 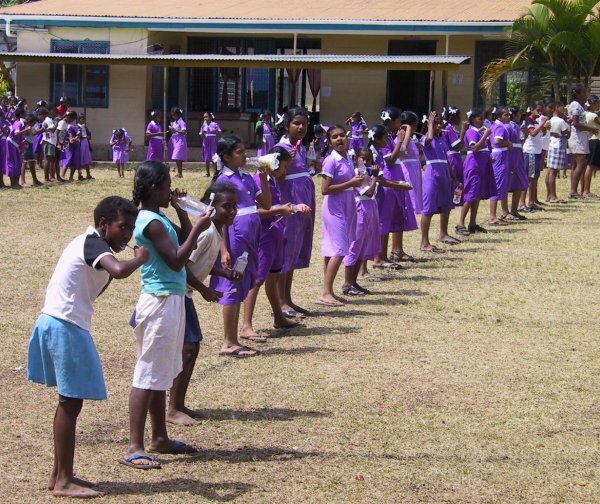 The scene below we witnessed in a school at Somosomo on the west of the large island of Taveuni was typical of what occurs every day in playgrounds throughout Fiji. Each child brings a bottle of water and toothbrush for their communal, post luncheon dental hygiene session (UK schools note!). 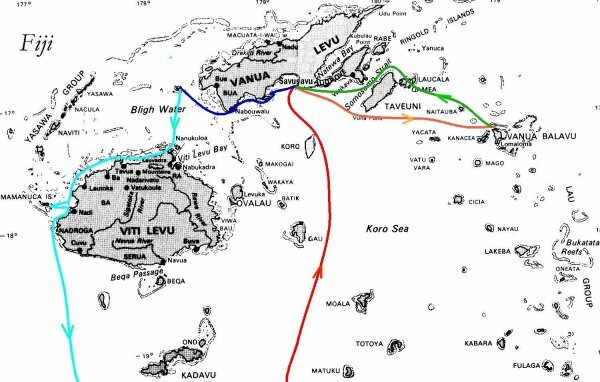 Our route then followed the south coast of Vanua Levu westwards. Firstly outside the fringing reef and then through the narrow Nasonisoni Pass to sail within more sheltered waters. It was a pretty daunting navigational exercise to sail 25nm in the open seas, arriving off a 200m wide, poorly marked passage between vicious reefs with breaking seas. Within the pass we were subjected to 3+m overfalls as the strong outgoing current opposed the trade winds. A couple of days later we popped out of the reef at the SW end of Vanua Levu and headed NW for the small island of Yadua some 25nm offshore. This was a magic place with a superbly sheltered bay guarded by twin horned coral reefs with a gap of no more than 50m wide to enter through. The snorkeling and diving there was even better than in the Lau with copious species of marine life, including naturally, plenty of white tipped reef sharks. 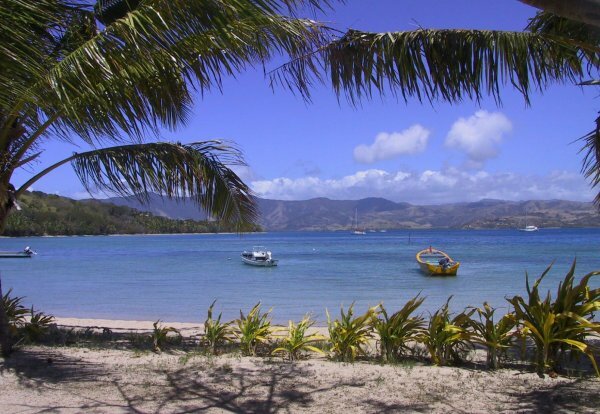 Dragging ourselves away from Yadua, we headed south to the main island of Fiji, Viti Levu. The placid scene above on the islet of Nananu-i-ra was our landfall within another fringing reef. 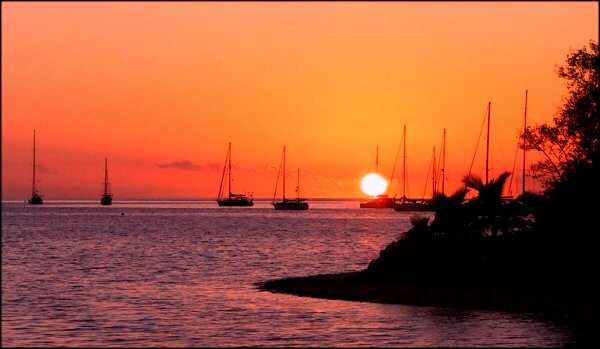 By now you will probably have gathered that almost everywhere in Fiji has a reef to test the prowess of visiting yachtsmen. Every year a fair number are found wanting, ending up damaged or wrecked on the viciously sharp, gripping coral. Nothing daunted we continued for another 60nm of meandering westwards through narrow channels within the reef on the north side of Viti Levu to the major port of Lautoka which is also the centre of a large sugar cane growing region. Its also the place we had to go to check in and out. We stayed only as long as was necessary, for they were burning cane stubble in the fields which drifted on the wind and coated everything aboard in long fibres of fragile, pure carbon. From there it was just a morning's sail out to the Mamanuca Islands where quiet anchorages abound. There is excellent snorkeling and diving on numerous reefs scattered around liberally to trap the unwary. The island of Malolo Lailai however is somewhat different with two large resorts that are very cruiser friendly (most unusual). There is a splendid anchorage with almost everything ashore you could possibly wish for, from swimming pools to shops and restaurants, with sail boards, canoes, Hobie Cats, etc, for hire. There is a 3$F bar (all drinks about £1) with BBQs set up around for general use. The sunset below, to bring our tale of our wonderful Fijian voyage to a close, was taken from the the bar as we were about to cook a couple of the gorgeous steaks from the island's store. We are currently heading south along the east coast of New Zealand's North Island, exploring as we go and aiming to be holed up in Tauranga by the beginning of December. We fly back to the UK on the 10th for two months via a three day stopover in Singapore. It will be the first Festive Season with our family for five years, with the added excitement of Bruce and Tracey presenting us with our first grandchild around Christmas. When we return to New Zealand in mid February we have boat fitting out to complete before we can resume touring Kiwiland. Last year we covered South Island in considerable detail so perhaps we will concentrate on some areas of the North Island we didn't get enough time at before. In May we will again be looking for a weather window to go north to the Tropics again. We will try to head for Tonga to resume our exploration of the Hapai Group and may head up to Samoa, returning via Wallis Island to Fiji. What we will do for the following cyclone season we have yet to decide. The options are to return to NZ, lay Amoenitas up in a potentially cyclone proof base in Fiji or head across to Australia to resume our circumnavigation.